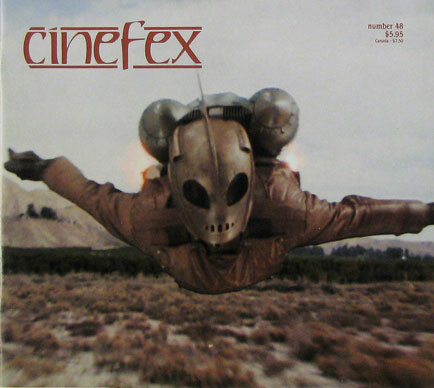 To capture on film the adventure and ambience of The Rocketeer - Dave Stevens' comic book evocation of Los Angeles during the golden age of aviation - director Joe Johnston assembled a team of ace collaborators including production designer Jim Bissel and special effects supervisor Jon G. Belyeu. A former visual effects art director, Johnston also returned to his alma mater — Industrial Light & Magic — for optical work and miniatures ranging from an eighteen-inch flying superhero to a thirty-four-foot zeppelin. When director Ron Howard set out to make the ultimate firefighting picture, even he supposed that much of the fiery action in Backdraft would have to be accomplished via miniatures and process photography. Special effects supervisor Allen Hall would prove him wrong. Although a handful of visual effects shots would indeed be produced by Industrial Light & Magic, nearly all of the nonstop pyrotechnics would be accomplished live on stage sets and urban locations - with major screen actors working in close proximity to conflagrations of awesome magnitude. Inspired by the period writings of Raymond Chandler and H.P. Lovecraft, Cast a Deadly Spell — a made-for-cable feature produced by Gale Anne Hurd for HBO Pictures — infuses the hard-boiled detective genre with unabashed elements of supernatural horror and offbeat humor. Makeup and creature effects — including a passel of gremlins, a living gargoyle and assorted demons large and small — were created by Tony Gardner and his Alterian Studios. Opticals and miniatures - primarily matte paintings and a cataclysmic finale — were provided by 4-Ward Productions.